After launching our very first HALO digital network in Silverburn, Glasgow, we now have 4 weeks' detailed audience measurement and it's going to amaze you. We're confident we have found the missing link for digital out of home advertising (DOOH) and that's got to be an exciting development. In a world where traditional media is continually valued using audience reach and OTS, HALO goes above and beyond for advertisers. 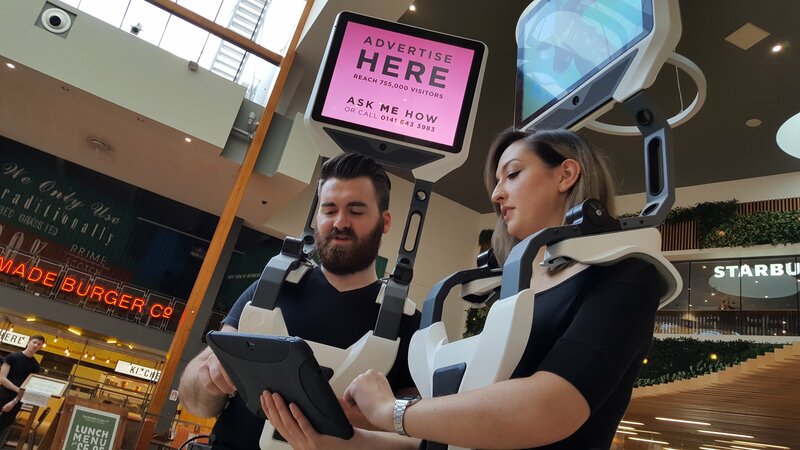 HALO not only increases Reach and OTS using iWalker's overhead and roaming design, but more importantly - and here's the kick, delivers exact captive audience and dwell time per advert in a way that gives advertisers the proof of who looked and for how long. HALO is the world's first roaming, digital advertising network that utilises detailed shopper data for effective planning and the roaming agility of iWalker teams to reach shoppers. Unlike the traditional media formats fixed to floors, ceilings and walls, iWalker's unmissable eye-level presentation finds and interacts with target audiences. Utilising advanced, integrated software platforms; Broadsign and Quividi, HALO delivers exciting digital media content while facial feature detection provides accurate audience measurement on age, gender and dwell time. Attracting brands such as UBER and Capital Radio to name a few, the network proved a massive hit with both shoppers and clients.